Randall Kerrick: Charlotte cop who killed Jonathan Ferrell resigns in settlement. 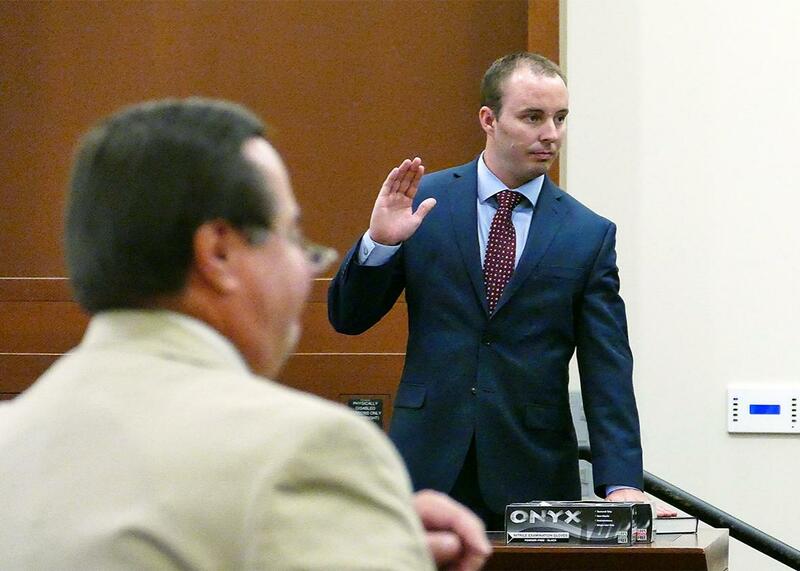 Charlotte-Mecklenburg police Officer Randall Kerrick testifies during his voluntary manslaughter trial, Thursday, Aug. 13, 2015, in Charlotte, N.C. The Charlotte, North Carolina police officer who stood trial this summer for shooting and killing an unarmed 24-year-old black man in September 2013 has resigned as part of a settlement with the police department, the Charlotte Observer reports. Randall “Wes” Kerrick, who is white, shot former college football player Jonathan Ferrell ten times during a nighttime confrontation. Ferrell had been in a car wreck in the suburban neighborhood of Bradfield Farms, and encountered Kerrick and two other officers after a frightened homeowner who believed Ferrell to be a burglar called 911. In a deviation from the script so many Americans have become accustomed to since the death of Michael Brown in Ferguson, Missouri, the Charlotte-Mecklenburg Police Department arrested Kerrick shortly after the shooting, having determined, based on dash-cam footage, that he had used excessive force. He was charged with voluntary manslaughter. The North Carolina Attorney General’s office at first failed to win an indictment on the charge from a grand jury, but after presenting the case a second time, convinced a second grand jury to deliver the indictment. According to the Observer, Kerrick’s last day as a Charlotte-Mecklenburg police officer was October 2nd; prior to that time, a representative for the department told me at the end of September, he had been on unpaid administrative leave. The terms of the settlement between Kerrick and his now-former employer provides him with $113,000 in back-pay. An additional $16,000 will go toward social security and Kerrick’s retirement, according to the Observer, and about $50,000 more will go the attorney who represented Kerrick in the civil suit that Ferrell’s family filed in the wake of his death. The settlement will cost the city of Charlotte a total of $179,989.59.